In Ayrshire, the people close ranks around their evicted ministers, stubbornly clinging to their Presbyterian faith. But disobedience comes at a price – a very steep price - and as neighbors and friends are driven from hearth and home, Alex becomes increasingly more nervous as to what her Matthew is risking by his continued support of the clandestine ministers – foremost amongst them the charismatic Sandy Peden. Privately, Alex considers Sandy an enervating fanatic and all this religious fervor is totally incomprehensible to her. So when Matthew repeatedly sets his faith and minister before his own safety and therefore per extension her safety and the safety of their children, he puts their marriage under severe strain. 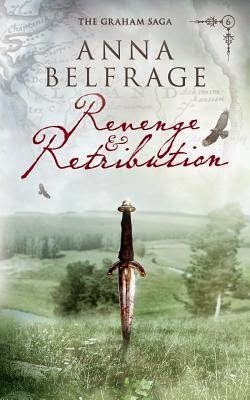 This is book three in The Graham Saga, set in 17th century Scotland during the reign of Charles II. I have not read the first 2 books in the series and that did not hamper me from enjoying (and understanding) this book. I will start by saying that I love the cover, there is just something about the crooked gravestones, the wind blowing and the bird perched to hint at the conflict, loneliness and despair that takes place. This was a fairly quick read for me, it didn't take long till it grabbed me and then I had a hard time putting it down. Now when I say a quick read I don't mean to imply that the book is a light and fluffy read, because it was far from that. The story line was very interesting, it is a part of history that I don't know a lot about. I know that I have said it before, but I have so much respect for writers of historical fiction because they have such a big responsibility to get history right and portray it as it happened. In The Prodigal Son, Anna Belfrage did it wonderfully, I could feel the conflict involving Sandy Peden, both from Matthew and Alex's point of views. Her knowledge of the time period and events was apparent and I learned a lot. Being introduced to Alex I could tell that she wasn't from this time period originally (from making everyone eat their vegetables and bathing, while everyone else thought she was nuts). It wasn't hard to bond with her and the family, the interactions with the children was real and you could feel her love for her family and that they were her priority. Matthew had his issues, between wrestling with his faith, conflicts with his brother and the situation with his son Ian, one could not help feeling his struggles. There is a lot going on in the book, the religious conflicts, family pressures, friendships tested and more. This is a series that I will start from the beginning and hope that there is more to come. Definitely a must for lovers of historical fiction. I was always going to be a writer – or a historian, preferably both. Instead I ended up with a degree in Business and Finance, with very little time to spare for my most favorite pursuit. Still, one does as one must, and in between juggling a challenging career I raised my four children on a potent combination of invented stories, historical debates and masses of good food and homemade cakes. They seem to thrive … Nowadays I spend most of my spare time at my writing desk. The children are half grown, the house is at times eerily silent and I slip away into my imaginary world, with my imaginary characters. Every now and then the one and only man in my life pops his head in to ensure I’m still there. I like that – just as I like how he makes me laugh so often I’ll probably live to well over a hundred. I've got this one on my shelf. I have not read the first two, so I'm glad to hear this works as a stand alone. Love the cover!